If you're looking for a strange, striking orchid, look no further! The flowers of Condylago rodrigoi are mostly purple and green, but also have a lot of white hairs on its petals. Condylago thanks its name to the lip which shoots upwards when it's touched. At the base of the lip you can see a shiny pellet, which makes the Colombian Condylago rodrigoi one of the most remarkable orchids. Condylago rodrigoi is named after the Colombian Rodrigo Escobar, the first botanist that was able to successfully cultivate this orchid. 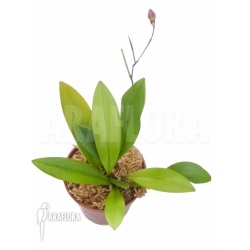 It's quite a small orchid, which makes it suitable to keep in a terrarium. The leaves won't often get any bigger than 5 centimetre. The flowers extend high above it, from stalks of 25 centimetre. Each opening up separately, the flowers can survive for years. Insects visiting Condylago rodrigoi will be hit into the pollen by the moving lip, ensuring pollination. Condylago rodrigoi flourishes in warm environments around 25⁰C. Don´t let the temperature drop below 15⁰C or rise above 30⁰C. A humidity around 80% is preferred by Condylago rodrigoi. Keep it in a light spot, avoiding direct sunlight. For the best results, water the plant using rainwater or distilled water whenever the substrate dries slightly. In practice this will be watering three to five times a week. A proper airflow will help prevent infections and disease. Orchid-mix will be a suitable substrate. 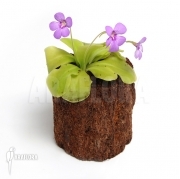 You can find this and other components in our ‘Plant Accessories’ section. Make sure moisture is able to drain from it. If your orchid gets too big, feel free to prune it.